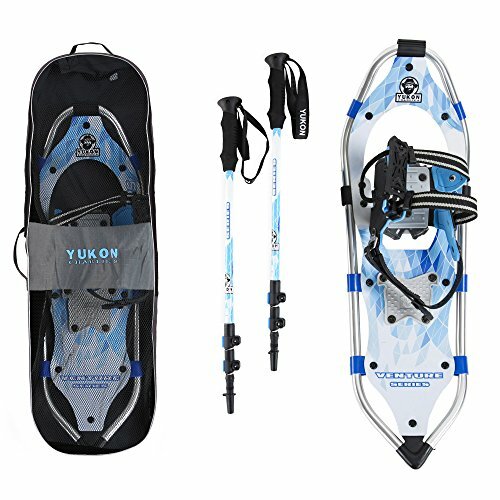 Handle the harshest of terrain in the worst of conditions with Yukon Charlie's Advanced 8 x 21 Inch Women's Snowshoe Kit with Poles and Bag. These snow shoes for the discerning alpinist are made of high-grade steel and aluminum for high strength, as well as HDPE decking to maximize flotation on snow. With Fast Fit II technology, they can strap onto almost any winter footwear. The powder coated steel crampons give you extra traction on unforgiving ice surfaces. Best of all, this kit comes with poles to give you even more mobility in the backcountry, and a bag to keep your Yukon Charlie's Advanced 8 x 21 Inch Women's Snowshoe Kit organized in the off season. If you have any questions about this product by Yukon Charlie's, contact us by completing and submitting the form below. If you are looking for a specif part number, please include it with your message.